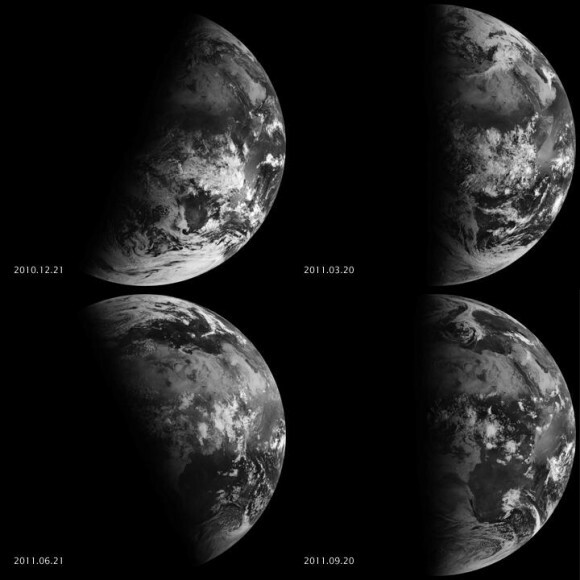 The GOES satellites sit in geosynchronous orbit, so they can see that the sun rises and sets faster at the equinox. The angle at which sunlight strikes the Earth is at a maximum at the solstice. Have you ever noticed the sun seems to rise and set faster around spring and fall or near the equator? For that matter, sunrise and sunset take longest in the summer and winter. It’s not your imagination. The amount of time (minutes) it takes for the sun to rise above the eastern horizon or sink below the western horizon depends on the season and where you are on the Earth. Satellites in geosynchronous orbit have taken photographs that make the effect easier to understand. The phenomenon occurs in both the Northern and Southern hemisphere because the Earth is tilted 23.5 degrees on its axis, but its tilt with respect to the Sun changes. At either the vernal (spring) or autumnal (fall) equinox, the sun rises in the east and sets in the west at the steepest possible angle. Day and night are the same duration. On the equinox, the Earth faces the Sun straight-on, with the tilt at a right angle. Of course, at the equator, the Sun is always at a right angle to the Earth, so the equatorial regions don’t see traditional seasons, plus the Sun always rises in the east and sets in the west. At the summer and winter solstice, the tilt of the Earth is at 23.5 degrees toward or away from the Sun. This accounts for seasons and the long days of summer and short days of winter. How Much Faster or Slower Does the Sun Rise and Set? The effect depends on how far you are from the equator. At the equator, duration of sunrise and sunset are unaffected by the time of year, yet as you move further north or south, there’s a measurable effect. For example, at 40° North latitude, sunrise or sunset takes about 2-3/4 minutes on the equinox, yet 3-1/4 minutes on the solstice.